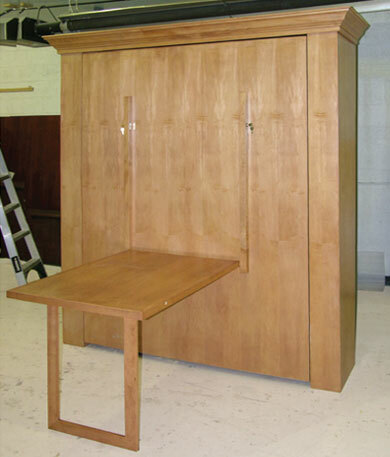 All of our table murphy beds feature dual plunge locks with keys for safety. 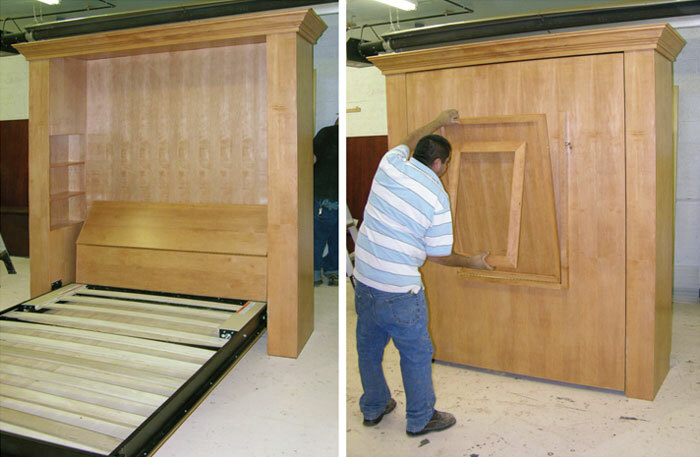 Adding a table up to 45″ x 45″ on a queen size Murphy bed using the SICO Eurobed mechanism adds approx. $650 to our Timbers, Mission, and Zen styles Price List. Larger tables require the heavy-duty SICO Room Maker mechanism. Contact us for a custom quote. 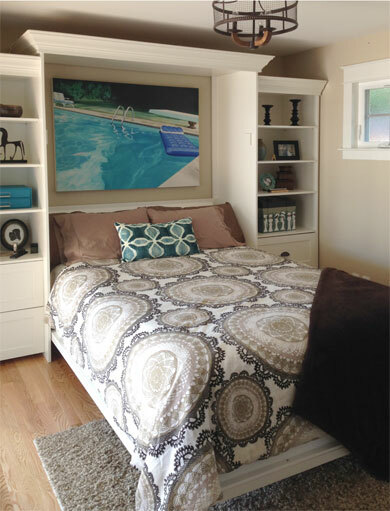 Many leg styles are available, although the “picture frame” is most popular, like the Zen bed below. 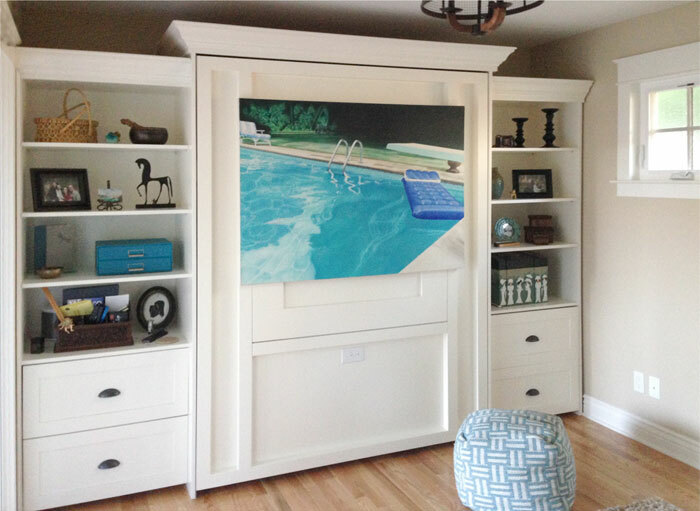 This Queen FlyingBed design features a hanging picture that moves from scene to scene. 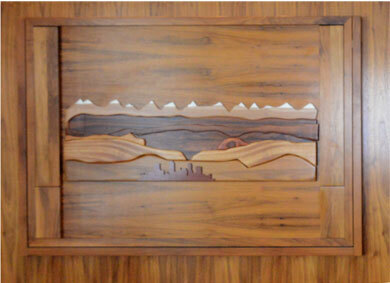 A favorite piece of art seems to benefit each changing function of this Murphy Bed with table. 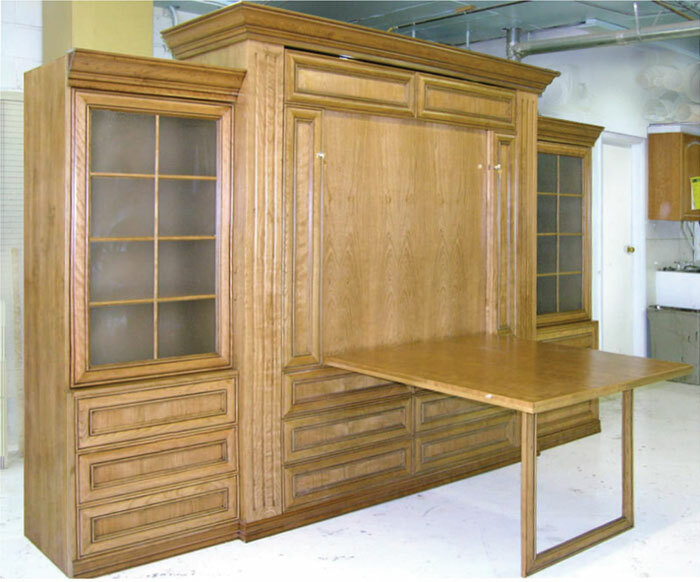 With Murphy Bed and Murphy Table locked in stored position, the room is open to receive any ‘open room’ purpose. 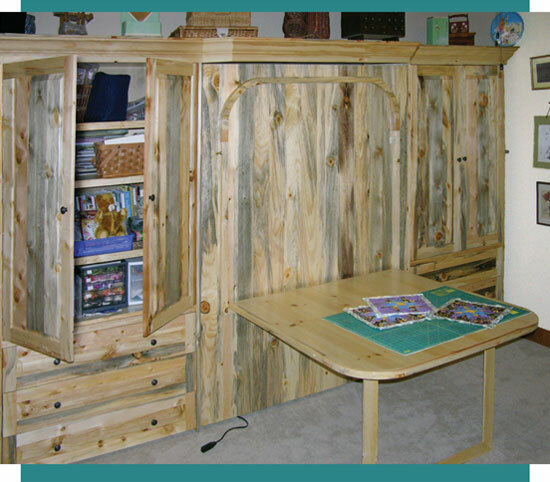 Removing the picture, a locked table is lowered to assist the new assignment of becoming a Craft Room. This large 45 x 45” table is supported by solid maple legs painted in white lacquer. The picture was hung where table was stored. 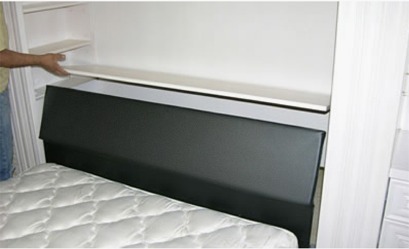 To ‘find’ the FlyingBed, the table is locked back onto the bed face and the whole bed is lowered to sleeping position. A generous 14” mattress guarantees sleeping comfort. The sloped headboard and overhead LED lighting from HERA is a real convenience to reading in bed. The top of mattress is 23” above the floor. That is a convenient height for entry/exit. 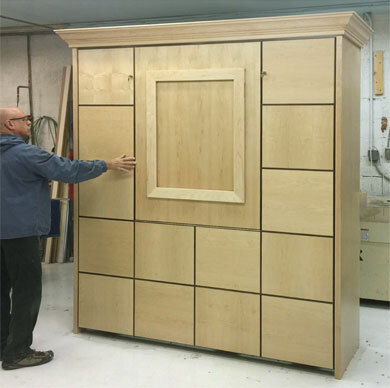 Most other Murphy Beds are less than a dining room chair in height. 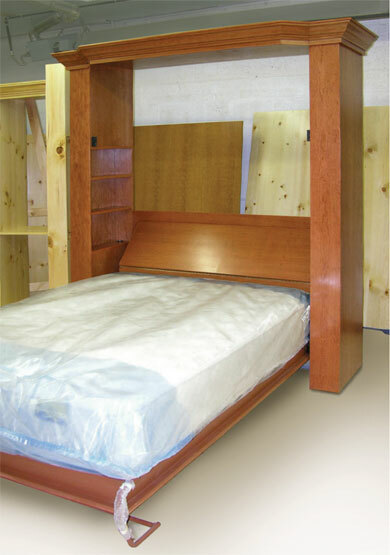 Our lacquer finished Maple beds are available in any hue and finish sheen. You are the designer. Tell us what would benefit the room the most in functional change and design compliment. 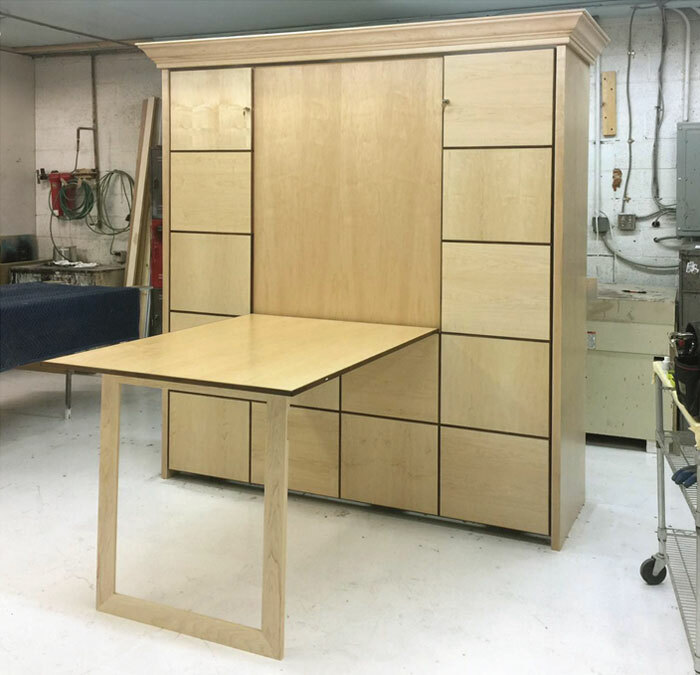 A King SICO Room Maker mechanism and frame easily accommodates and lifts a 14” thick mattress and this complex “Zen” themed bed face and table. Maple panels are capped in walnut to accent the pattern. Very small room with a very big bed! The table is 36” wide and 42” in length. Being installed in the Bronx. See more Zen Murphy beds here. 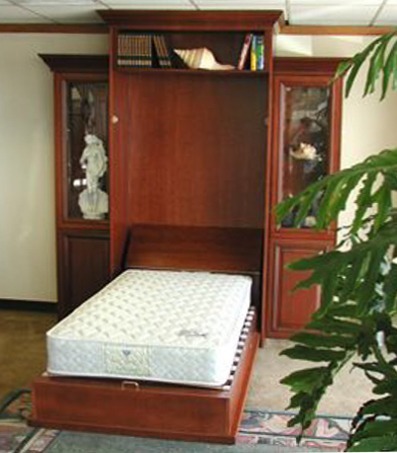 This Table Murphy bed has a 15” thick mattress that is luxury to the maximum. 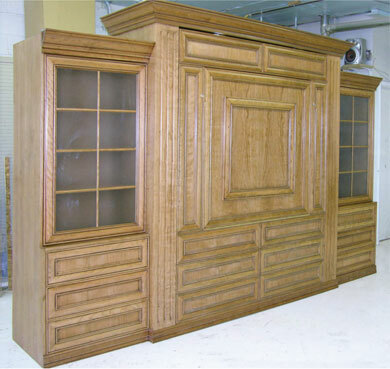 It is a Walnut encasement in a natural finish. Custom Denver skyline overlay art is part of the table (underside when open). An overhead light system both illuminates the table and acts as a reading light when bed is lowered. The table measures 55” x 35”. 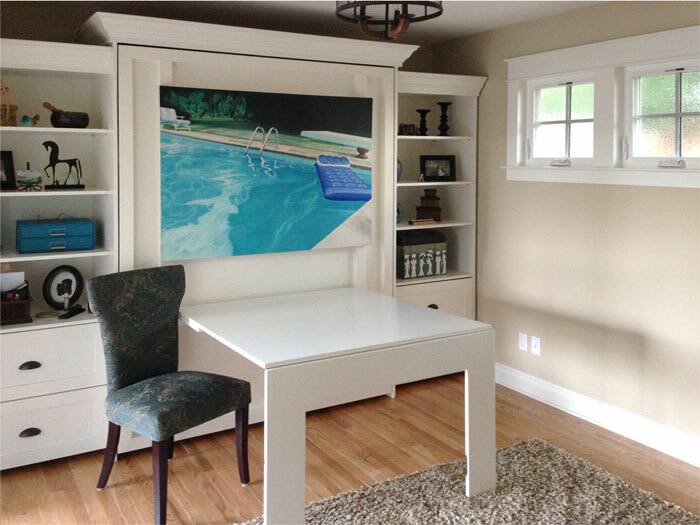 60″ x 40″: plenty of space to work! 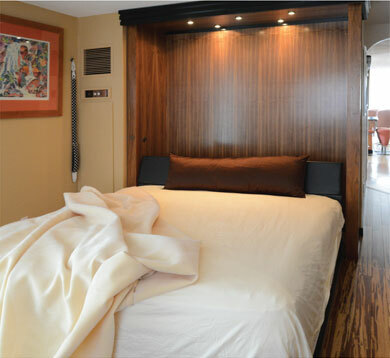 Our innovative Dropped Deck and hidden Interior Nightstands also provide plenty of space for Cindy’s guests. This is our favorite panel design for Cherry. The finish is glazed with accent toning- what we call ‘Tommy Bahama’. 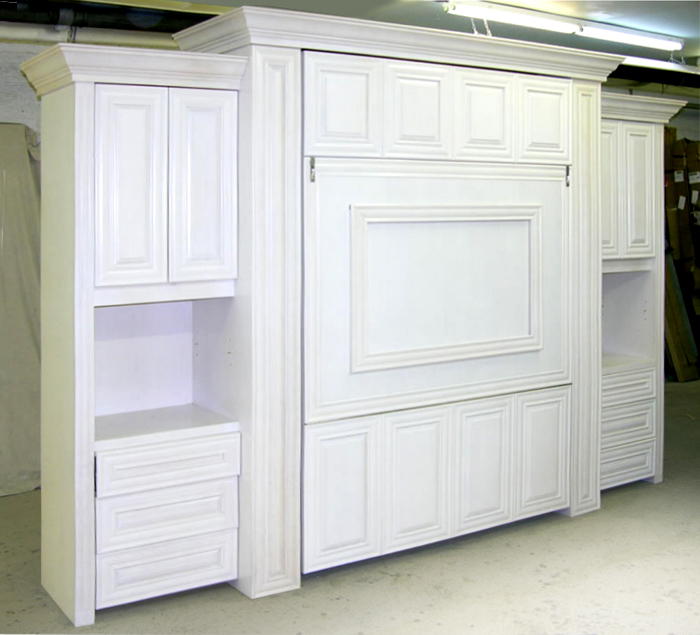 The base cove molding makes this system act as a piece of furniture. The Picture Frame leg on the table looks great when bed is stored. Art in the picture-frame leg will really make this setting complete. Frosted glass doors are accented with cherry mullions. Drawers have BLUM bottom-mounted glides that extend fully and have a soft-close feature. Interior has no-heat LED light system from HERA®. 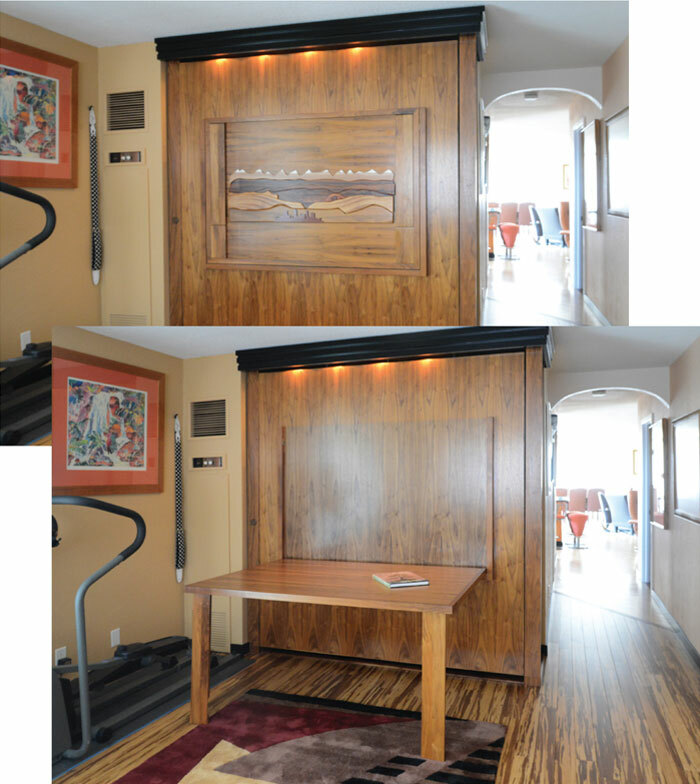 A real Cherry wood FlyingBed with lockable 34” x 42” table. The SICO Eurobed system easily can lift this 13” thick queen mattress. Sloped headboard and hidden nightstands. Features an extended light bridge that allows lights to be dual purpose: Illuminates lowered table and acts as bedtime reading light. This client wanted a large table with soft corners for her grand children’s visits. She planned to teach them how to make Japanese quilted art pictures. Beautiful. A SICO sidefold Queen Eurobed system with big table and lift door overhead storage. Both of these systems are Beetle Kill Pine from a Colorado Forest. 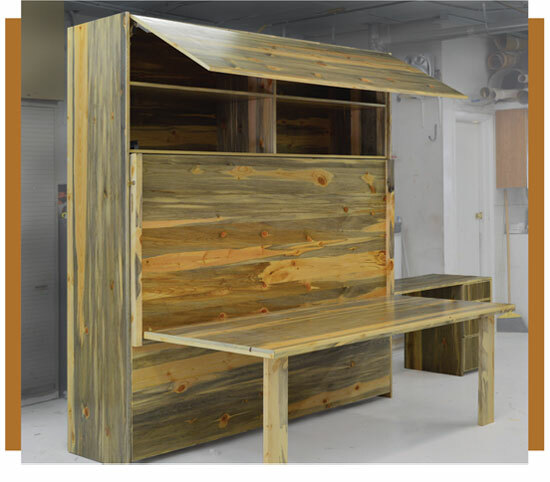 See more Beetle Kill Pine Murphy beds here. 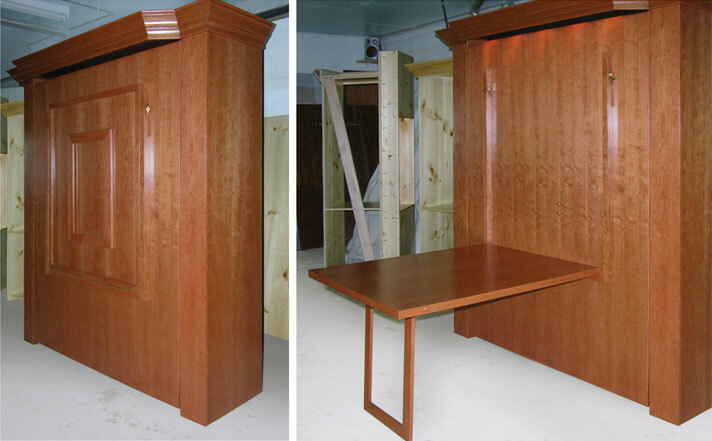 Queen SICO Eurobed Murphy bed with Table and Picture Frame leg in Cherry with a light walnut finish. Cherry is a very versatile wood in the wide variety of stain colors it will take. This particular design is what we call “plain Jane” or bed-in-a-box, and has nearly all of our signature features: hidden interior nightstands, sloped headboard, and full wood grain back panel. 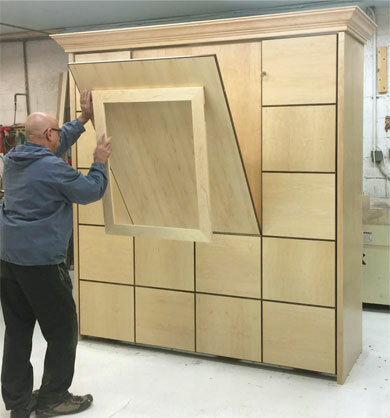 Adding a table up to 45″ x 45″ on a queen size Murphy bed using the SICO Eurobed mechanism adds approx. $650 to our Price Sheet. Larger tables require the heavy-duty SICO Room Maker mechanism. Contact us for a custom quote. 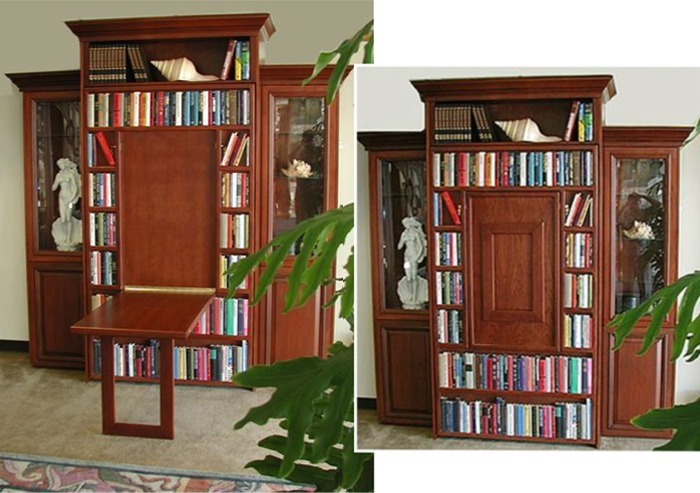 This combination faux bookcase & table murphy bed system was on the showroom floor for months and always taken to Trade Shows, until we sold it! It was impressive with its beveled glass and lighted cabinets.